In today’s competitive tech landscape, it is not sufficient for a database to simply process and store data — and Redis knows this. That’s why Redis Enterprise operates using an active-active architecture, which means that all database instances are available for read and write operations and are bidirectionally replicated. Redis Enterprise is the only NoSQL database on the market to leverage CRDT-based active-active architecture, making it uniquely suited to use cases in industries ranging from ecommerce to fraud detection. Redis Enterprise achieves active-active replication by employing CRDTs (conflict-free replicated data types). Our highly available database offers built-in conflict resolution support, so if you experience an 11th hour crisis, our team will be on hand to salvage your database performance while ensuring that you don’t lose any crucial data. But that’s not the only benefit of active-active architecture; it also ensures high performance, strong eventual consistency, simplified application development and more efficient resource utilization. 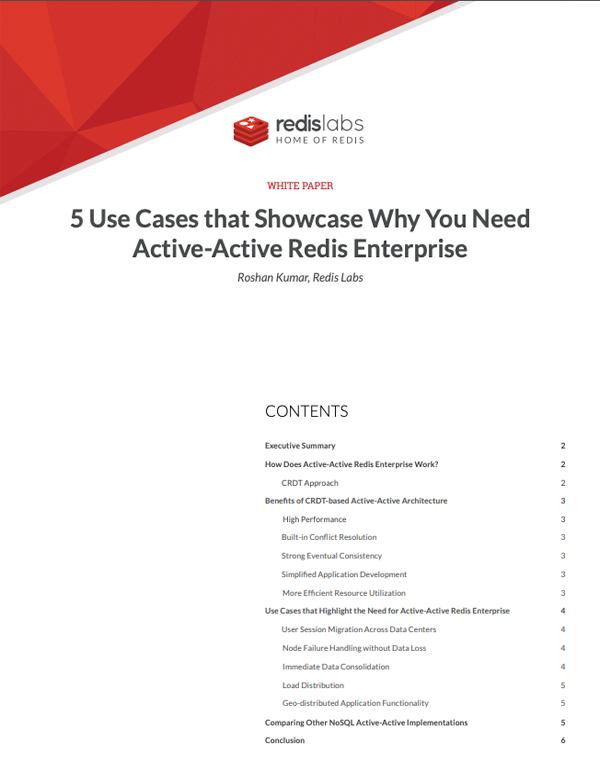 In this ebook, we explore the distinct ways in which active-active Redis Enterprise can augment user experiences and boost a company’s performance. We also compare Redis Enterprise to other databases on the market — DataStax and Couchbase — and Redis performs better across the board. Not only is it suitable for high frequency writes, but also it saves developers from having to resolve data conflicts at the application level, and unlike quorum-based models, Redis Enterprise does not have to wait for a majority of servers to vote to execute a read or write transaction. With active-active Redis Enterprise, you can expect a database that both knows its competition and improves upon it. Redis Enterprise’s high performance makes it the best choice for geo-distributed applications because it reliably addresses a variety of use cases. Redis Enterprise can optimize user experiences by facilitating user session migration across data centers, handling node failure without incurring any data loss, immediately resolving and consolidating data across database instances, distributing load across multiple servers and ensuring consistent data across geo-distributed applications. Active-active Redis Enterprise supports the responsiveness, scalability and geo-distributed functionality required by today’s modern applications without compromising on speed or performance. Please download our ebook for more information about the various benefits of Redis Enterprise’s CRDT-based active-active architecture, and to find out more about how this architecture works.